Deloras Dean Culpepper, Female, born __ 1940 in Hale Co., Texas, child of J E Culpepper and Valrie Lela Crane. Donnie Dale Culpepper, Male, born __ 1944 in Hale Co., Texas, child of John Early Culpepper and Valrie Lela Crain. Janice Dale Phillips, born __ 1949 in Eastland Co., TX, daughter of William Joe Phillips and Roxie Lee Partee. .... this picture was taken at the Bradford homeplace. In 1906 my grandfather purchased the farm SE of Pine Forest. The house was old and cold and had a hall [breezeway] down the middle. My mother was never sure if she was born here or on the farm my grandfather rented when he came to Texas. The rented farm was located near the Mr. Frank Adams place north of Pine Forest. At that time in history folk could go east, cross Stouts Creek and come out at the Luther Culpepper farm. That road has long been closed. 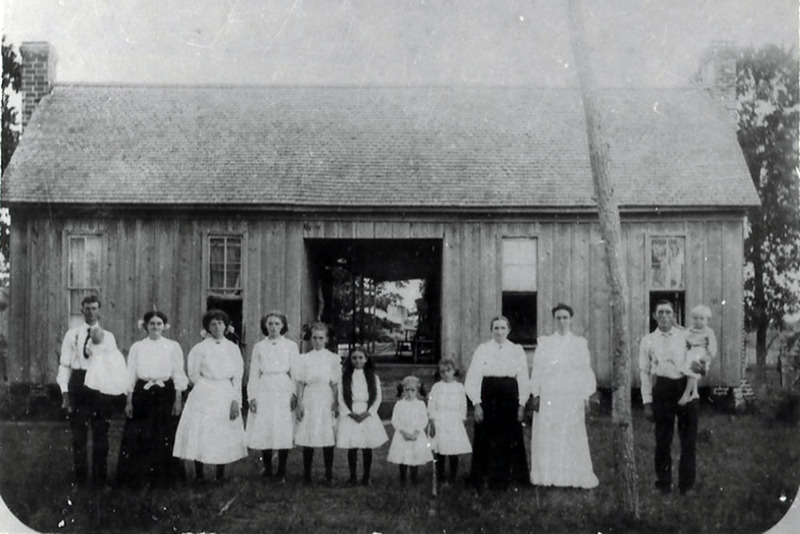 The family moved to the newly purchased farm of 72 acres and we know for sure Guy, Aubrey and Mattie were born at this location. In 1916 James Bradford built a new house where this old house once stood. E-mail written 1979 - 2012 to Lew Griffin from Lavyn Elaine (Wright) Sisco (ID:23046), 1411 Cherrywood, Sulphur Springs, TX 75482, e-mail address.